As ACA Repeal Vote Nears, Kansas Debates Expanding Medicaid An estimated 300,000 Kansans could qualify for health care coverage, which comes as Congress debates replacing the Affordable Care Act. Gov. Sam Brownback delivers his State of the State address to a joint session of the Kansas Legislature in Topeka, Kan., on Jan. 10. Lawmakers are considering whether to expand Medicaid, which Brownback opposes. Kansas lawmakers know they are late to the Medicaid expansion party, but they appear determined to show up anyway. "I feel like now is as good a time as any," says Anthony Hensley, the leader of the Democratic minority in the state Senate. For the past three years, Republican Gov. Sam Brownback and legislative leaders were able to block debate on expanding health care for the disabled and working poor via Medicaid, a component of the 2010 Affordable Care Act. In last year's primary and general elections, Kansas voters — frustrated by chronic budget problems caused in large part by income tax cuts that Brownback pushed through the Legislature — replaced several conservative incumbents with moderate Republicans and Democrats who promised to stabilize the state's finances, fund public education and push for Medicaid expansion. Coalitions energized by the influx of new lawmakers wasted little time in making good on those promises. 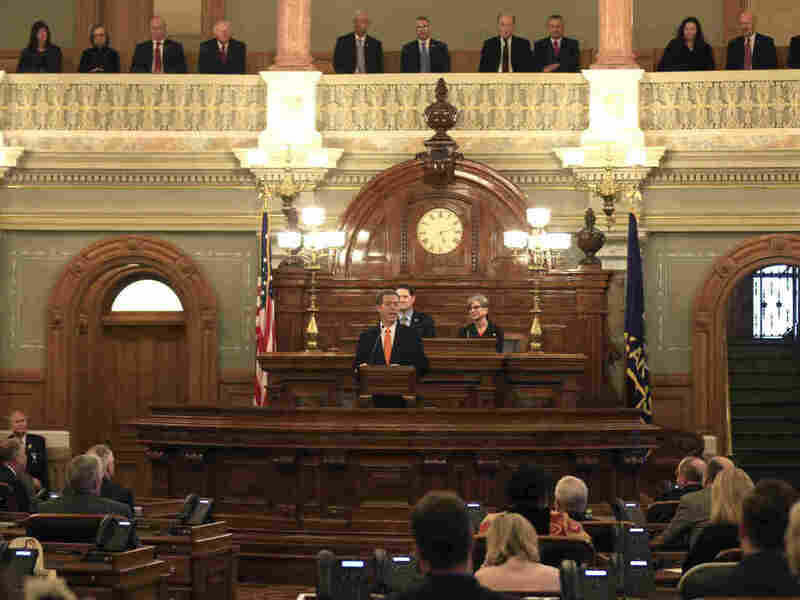 The Kansas House recently passed an expansion bill by a margin close to what would be needed to override a Brownback veto, should it come to that. A Kansas Senate committee is holding hearings on the expansion bill and may vote on Thursday to send it to the floor. That is the same day the U.S. House of Representatives has scheduled a vote on a Republican proposal to replace the ACA. The replacement bill before Congress would phase out federal funding, starting in January 2020, for expansion programs in 31 states and the District of Columbia as well as any others to implement programs between now and then. But it would not immediately close the expansion window for states that have not acted, says Tom Bell, president of the Kansas Hospital Association. "From our perspective, this provides some encouragement for states to expand their programs prior to that Jan. 1 of 2020 date," Bell says, noting that the bill would continue funding 90 percent of expansion costs for people enrolled by the deadline. David Jordan, executive director of a Kansas coalition pushing for expansion, is making a similar pitch to lawmakers. "This is really an invitation to states like Kansas to expand their Medicaid programs," Jordan says. "We have everything to gain by taking this step and nothing to lose." To date, Jordan says, the failure to expand Medicaid has cost health care providers and the Kansas economy an estimated $1.7 billion. Currently, Kansas limits Medicaid eligibility to children and pregnant women in low-income families, people with developmental and physical disabilities, and seniors who cannot afford nursing home care. Parents are eligible only if they earn less than a third of the federal poverty level, or about $9,200 annually for a four-person family. Single adults without children are not eligible. Expansion would qualify all Kansans earning up to 138 percent of the poverty level, annually about $16,642 for individuals and $33,465 for a family of four. An estimated 300,000 Kansans would qualify for coverage under expansion, though only about half that number are expected to initially enroll. Senate President Susan Wagle, a Republican, says she expects the Kansas Senate to pass the expansion bill next week, perhaps by a vetoproof margin. But even if Kansas lawmakers are able to advance an expansion plan to the U.S. Department of Health and Human Services, she is not convinced federal officials would give it serious consideration. "The timing is wrong," Wagle says. "It could just sit there because what I see the feds doing is winding that program down."